One of Prince Charles’ virtues (he has many in my opinion – for which he gets scant appreciation at home and abroad) is his consistent public commitment to addressing climate change. Within the limits imposed on him by his royal position, he has been a strong voice for action. His latest initiative is a book for popular audiences, entitled simply Climate Change (may still be difficult to find in the US). 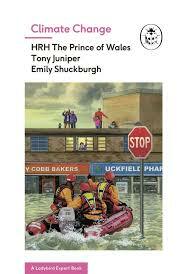 I’m not sure what impact this little book will have in the UK, let alone this country, but folks who work on climate change communications issues should definitely give it a look. Maybe Scott Pruitt should read it! There is often a lot to learn from checking on what our European counterparts are doing. A report was just released describing how European highway agencies are addressing climate change mitigation and adaptation and it bears looking at by people in the US who are confronting the same issues. The report, called Acting on Climate Change, was published by the Conference of European Directors of Roads (a sort of European AASHTO) and is available here. The authors suggest that mitigation and adaptation are “fundamentally different” and suggest a distinctive approach for each. The report is also laced with fascinating examples from European experience (Norway is developing “Urban Environment Agreements,” which mandate that all future transportation demand be met by transit, walking, or biking. Sweden has set a goal of having a fossil-free vehicle fleet by 2030.). Congrats to the CEDR team for a thoughtful approach to providing real-world tools to agencies confronting climate change.